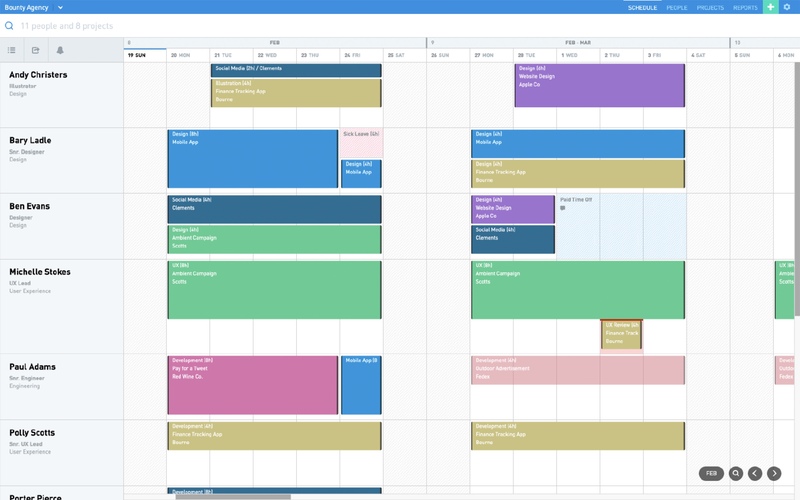 The schedule is a bird’s-eye view of who’s working on what and when. It's your one-stop shop for project scheduling and managing your team’s utilization. Track time off, sick leave, and public holidays. View the schedule your way with virtually limitless sorting and filtering options. See schedule updates as they actually happen. Keep an eye on who’s running hot—and who’s not. 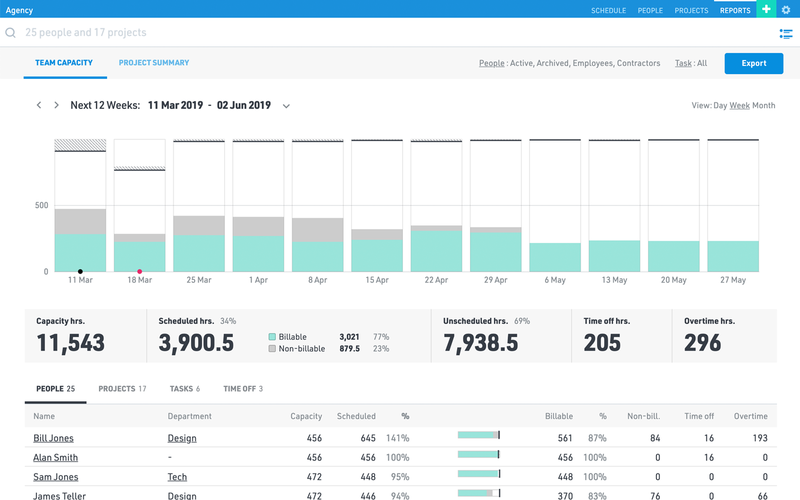 Included are all the tools necessary to share data with your existing project management, finance, and time tracking apps. It’s easy and effortless. Access is safe and fast with our Google sign up and sign in. Upload your team and active projects from Excel. Export anytime. Stay up-to-date with the latest schedule straight from our Slack app. Create custom combinations with our powerful API. Send data to and from the apps you already use with Zapier. Setup email notifications for your team to be sent daily, weekly or instantly. Get a real-time snapshot of your team’s utilization at any time with Reports. Drill down to departments, clients, projects, and individual team members. Keep track of your project budgets to ensure your team is staying on task. Since 2012, we've been delivering easy, super-fast scheduling to customers in more than 150 countries. With SSL-security, performance monitoring, daily backups, and regular feature releases, you can be sure that you’re always getting the latest, greatest, and safest resource scheduling solution available. world’s top brands depend on us daily. But don’t just take our word for it, view the features that teams love. Learn more about features, from resource scheduling to reporting.